Thanks to my stay-at-home-mom status, I live in t-shirts. The rainbow of knit T's in my closet would make Old Navy blush. It's about this time every year they start to get a little boring. I've seen lots of t-shirt refashions lately, which seems like a good solution to my problem. Many of them seem to have ruffles though, which isn't what I was looking for. This seemed like the kind of project that would be fun to do without much of a plan so I grabbed a shirt that I didn't care if survived the experiment and kinda winged it. You'll either need a second shirt, long sleeves or some knit fabric. Cutting off the short sleeves doesn’t leave much fabric to work with. I used knit scraps left over from Codi's Maxi Dress. Don't tell her and maybe she won’t notice. Draw a line diagonally from the center of the back of the neck to under the arm. Cut along line on both sides through both layers. Draw a line straight across the top, just under the neck. Cut through both layers. Cut about 1 ½” off the bottom. My shirt has been around for a while, so the hem was pretty uneven. I ended up cutting off 1 – 2” in order to make it straight. Cut three pieces from your second knit, each 40” long and 2” wide. If you don’t have 40” long pieces, sew shorter pieces together, preferably with a diagonal seam to cut down on bulk. If you aren't sure how that's done, check out the second photo down on Reusable Shopping Bags. Cut two pieces, each ½” longer than your shirt is wide (in my case, that’s 18”) and 3 ½” wide. Set those aside for now. Stitch the three 40” pieces together at one end. The fabric I used has a definite wrong side, so I folded them in half first. If you're using sleeves or a second shirt, that shouldn't be necessary. Braid together, keeping the wrong side turned in if you have one. Pin the finishing end so it doesn't come unbraided. Hem armholes by turning under 5/8", turning raw edge inside, pressing and stitching with a narrow zigzag stitch. Turn upper edge at neck under 1 ¼”, then turn the raw edge under ¼”. 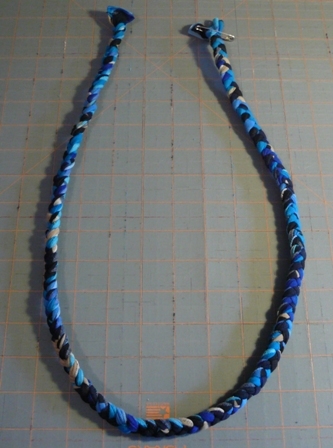 Stitch with a narrow zigzag to form a casing. Make sure to stitch all the way to the armhole instead of stopping at the edge of the casing inside. Feed the braid through the casings, front and back. Pin the ends of the braids together and try shirt on to make sure length of braid is right. Sew ends of braid together. Pull until the sewn-together end is inside the back casing. Center braid in casing and pin in center. Gather shirt equally on both sides of pin. Stitch edges of shirt to hold braid and gathers in place. Repeat on back, gathering less. 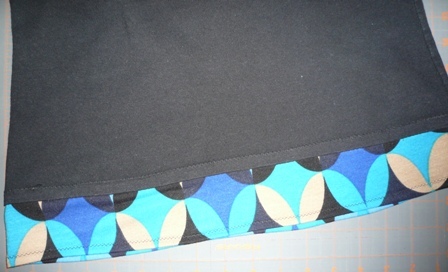 Stitch ends together on bottom pieces (the 18” by 3 1/2" pieces we cut earlier) with ¼” seam to form a continuous loop. 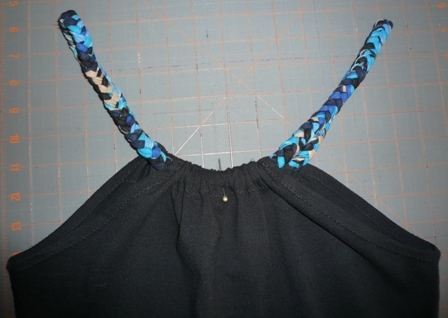 Pin loop to bottom edge of shirt, right sides together. Stitch with a 3/8” seam. Press seam up toward shirt. Zigzag stitch over raw edge on inside. Hem bottom edge with a ¼” seam. Press the seams and you're done. I can't believe this started as a t-shirt I didn't even like anymore!